If your research involves interacting with people to gather their ideas or opinions, you will probably want to keep track of their demographic attributes (like age or gender) and use them as a basis for comparison. This page explains how to setup demographic data depending on the type of files you are working with. Some of the features described here are only available in NVivo Pro and NVivo Plus. You use NVivo's case classifications to record descriptive information about the people or participants in your project. Although this page focuses on people, you could also use case classifications to record descriptive information about institutions and places. Make a case node for each participant. 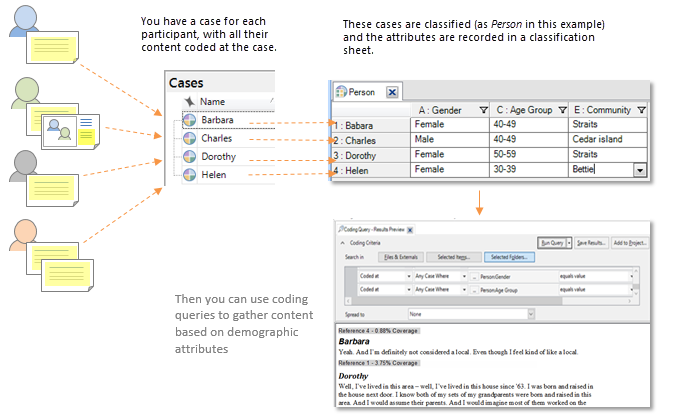 Classify the case node as a person—you could also have classifications for different types of people, like students or teachers. Assign the attributes—for example, age group and gender. Code a participant's comments at their case node—coding is how the content is assigned to the case. Import the interviews into NVivo—make sure the document names reflect the names you use to identify the interview participants. Create a case node for each participant and code their interview at the case node—to do this quickly, select all the interviews in list view, right-click and then select Create As > Create as Cases. Participant names are identical to the case nodes you created in NVivo. The top-left cell of the spreadsheet contains the classification name Person. Import the spreadsheet—on the Import tab, in the Classifications group, click Classification Sheet. On Step 2 of the Import Classification Sheets Wizard, make sure you choose Case Classification from the Classification type list. The Person classification sheet is created and displayed in Detail View—you can sort, filter or export the classification sheet and you can edit the attribute values. Import the focus group documents into NVivo. Create a case for each participant and code their comments at the case—to do this quickly, you can auto code the documents by speaker. Participant names match the names of the case nodes you created in NVivo. The Person classification sheet is created and displayed in Detail View—you can click in a cell to assign or create new attribute values. If you have captured data from Facebook, Twitter, or YouTube—you can use auto coding to create case nodes for the participants (for example. Twitter users) and assign biographical information such as gender or location. For ideas on approaches to working with social media datasets, refer to Twitter data. Once you setup the demographic data for your research participants, you can use queries and visualizations to make comparisons. 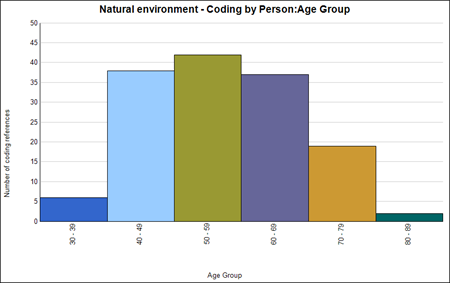 For example, you could use a matrix coding query to compare attitudes about environmental issues based on gender—this matrix displays the number of coding references at each intersection and helps you to answer questions like How often did women mention community? (you can double-click in the cell to see the coded content). If you would rather ask the question How many women talked about community? you can change the count that is displayed in the matrix—right-click and select Cell Content, then click Cases Coded, and then click the classification Person. Find out more about queries and charts.